Electronic music and EDM are generally upbeat and funky – you won’t get the same experience by listening to these genres twice, and the most crucial factor that heavily impacts how you enjoy in your music is the headphone model you’re using. 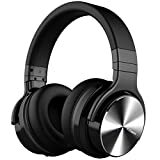 We’re here to offer you some of the best headphones for electronic music and EDM from reputable brands such as Kowin, Sony, Audio Technica, and Skullcandy, so let’s proceed, shall we? Deep, pronounced bass: If you’re into electronic music, you’ve probably heard the term “drop the bass” more than once. The “bass” refers to the lowest frequencies in the given song, and they’re the ones that “make you move”. Headphones with strong, deeply pronounced bass will ensure that your listening experience can compare to the real deal, as if you were on an actual gig. Nearly all headphone models have a solid bass feel, although we’re looking for something a bit more drastic here. The models we’ve provided you in the sections below all feature a form of bass “enhancement”, so it’s only obvious that they’re different from your average standard headphone models. Balanced soundstage: If the bass is too high, it will end up “eating” other frequencies, and you don’t want that if you truly wish to enjoy in your music. A balanced soundstage, combined with strong drivers will supply enough handling power for the deeper bass to remain in line without hindering the mids and highs. Noise-cancelling: Electronic music is, with a few exceptions, quite detailed and noisy. Ambient sounds can ruin your experience in more ways that you can imagine, so it’s quite important to find a headphone set which features at least a sort of noise cancelling or ambient noise reduction. Price: In truth, there are cheap headphone models that are well suited for electronic music – such is the case with Sony’s MDR XB50AP/R, and we all know that this brand is to be trusted, right? On the other hand, people who wish to improve their listening experience and reach new heights should at least consider more expensive models, like Skullcandy’s Crusher, or Cowin’s E7 Pro. We’re starting off with our top pick – Sony’s XB950N1. These headphones are the most expensive option in our review, but rest assured, they’re also the best headphones for electronic music you’ll find in the price range. These headphones boast industry-leading noise reduction technology, which means that no environment sounds will get between you and your listening experience. They’re also wireless and feature a long playtime, needing only seven hours to get the juices back up. With a balanced soundstage and incredibly powerful drivers, Sony’s XB950N1 will make your electronic music tracks come to life in a manner you’ve never seen before. Top-quality audio reproduction is the first thing you’ll notice when you start using these headphones. They’re also very comfortable, and given that they’re wireless, they’re also very easy to use and convenient. Bulky design is, perhaps, the only problem you’ll face with these headphones. The earcups are oversized, which might be a problem to some people. If you need the extra bass, you’ll get it with Sony’s XB950N1. This headphone set is made for electronic music lovers – it holds a huge value for the cash. The ATH-WS1100iS comes outfitted with a huge 53mm deep-motion audio driver that delivers high-end sound. There are some bleeding-edge features onboard, including Bass Venting system and the rigid housing, as well as the dual-layer earcups. This model isn’t wireless, but it comes with a non-tangy 1,2m cable. 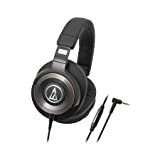 Audio-technica’s ATH-WS1100iS features an exquisite bass venting system – it damps out the air from all sides, providing outstanding bass in turn. The housing is incredibly robust, and we guarantee that these headphones will last you for years to come. On top of that, the dual-layer earpads only bolster the already durable construction and provide additional comfortability. As with most headphones tailored for electronic music, this model is also quite bulky. The oversized earcups might not be that much of a problem, but the fatigue induced by them will eventually lead you to understand this downfall a bit better. If it’s power and deep-clear bass that you crave, we advise that you give Audio Technica’s ATH-WS1100iS a shot. These are among the best headphones for EDM available for the buck. Next up is Cowin’s E7 Pro – these Bluetooth headphones feature active noise cancellation (you’ll need a battery), 45mm drivers, and incredibly comfortable ear cushions. They’re available in three color variations, including black, red, and white, and it’s safe to say that you’ll have a hard time finding a better-looking headphone set in the price range. First of all, the E7 Pro offers professional-grade sound quality and doesn’t cost that much. The bass response is deep and clear, which makes it ideal for electronic music. To top it all, you’ll be able to enjoy music for up to thirty hours (if they’re fully charged). The joints between the cups and the headband are relatively flimsy – if you handle these headphones, though, you won’t find any issues regarding durability. Professional audio quality, high-end features, plenty of comfort, and outstanding active noise cancellation – is there anything more you need for a perfect EDM listening experience? Skullcandy’s Crusher headphones are hip and cool – that’s the first impression most people get after seeing them for the first time. They come outfitted with patented Sensation55 drivers that was specifically made to enhance the bass feel. On top of that, there’s the REX40 driver that minimizes the distortion and smoothes out the bass-heavy soundstage. The earpads aren’t too big and feature acoustical porting for additional comfortability. The Crusher looks very cool, it’s comfortable to wear, and you’ll have a hard time finding a headphone set with better bass response. On a side note, these headphones aren’t expensive at all. 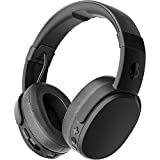 The only thing you won’t like about Skullcandy’s Crusher is that the noise cancelling features don’t actually cancel out all of the ambient noise. If you’re fond of ambient noise reduction features, you should probably save up for one of the models we’ve mentioned in the sections above. Overall, Crusher does exactly what it was supposed to – it delivers deep, accentuated bass and boasts a well-balanced soundstage. To top it all, it doesn’t even cost that much. Sony’s MDR-XB50AP is the least expensive model in our review. It features 12mm dome drivers that provide deep bass feel, they’re wired, and feature an integrated microphone for easy playback control. The hybrid silicone buds ensure a snug fit at all times while the tangle-free flat cord won’t give you any troubles. 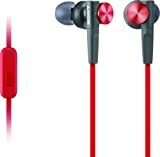 Affordability before all else – this is the cheapest option for people who are looking for solid earbuds. The soundstage isn’t exactly as balanced as it should be, even though these headphones come from Sony. The mids are harsh, and the highs leave a lot to be desired. They’re good for the buck, but comparing them to our other picks might not be fair. Consider these headphones if you’re really low on cash, otherwise save up for a more expensive option. Nice. My Audio technica ATH-WS1100iS made the list. I tell you these headphones are really good especially for EDM. Sony MDR-XB50AP/R are pretty good if you’re looking for something very cheap however, mid range is pretty harsh. I have bought multiple Sony headphones in the past and they have all proven to last long and are made with incredible quality.